The adorable Napoleon cat was the brainchild of Joe Smith, a Basset Hound breeder. Mr Smith had followed with much interest the progress of the Munchkin cat and after much research, decided to create short-legged cat with a difference. He created the Napoleon in 1996 and named it after Napoleon Bonaparte (the French Emperor in the 1800's), who was known for his short stature. This small cat is a cross between the Persian cat and the Munchkin cat. The result of this union is a cat with the body-type and face of the sweet, baby doll-faced Persian cat and the adorable short-legged Munchkin. 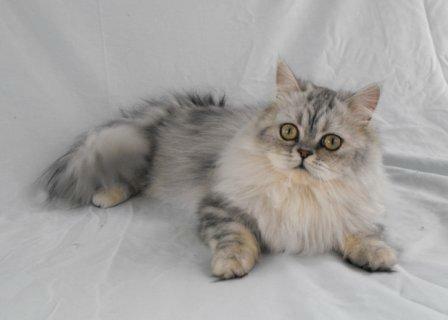 Breeding programs would include the Persian Group i.e. the Himalayan and Exotic Shorthair cat and the long and short-haired Munchkin. 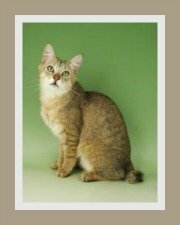 A litter of kittens usually has both long and short-legged kittens - all are Napoleon cats. The Nap has Preliminary New Breed Status at TICA but is not as yet accepted by other cat registries. The Napoleon Working Breed Group, led by Margie Gardner is currently working towards advancing the breed. 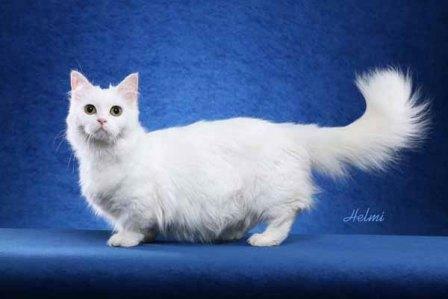 This cat is considered a dwarf cat breed and is a new and rare cat breed. 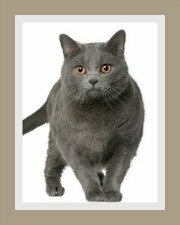 It should be noted that it is not a short legged Persian. The breed is still 'a work in progress' and as such, information is limited. Some of the information below has been adapted from the info provided by Kristin DuBois of Blue Sky Cats. The Napoleon is a strong, sturdy cat with well developed, firm muscles. It is characterized by short, well developed legs that do not hamper its mobility in any way. The tail should be in proportion to its body and medium short in length. 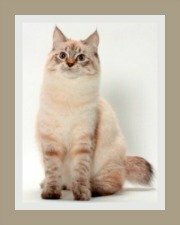 The Napoleon cat should have a rounded head and a face with an open, pleasant and sweet expression. Its nose is described as short, but certainly. not snub. Ears are set wide apart and are generally medium to small with rounded tips. To complet the picture, the eyes are large, round and expressive. Eyes should have a brilliant color and it is preferred that the color conforms to coat color. 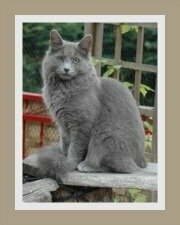 There are two coat types - the longhaired and shorthaired version. 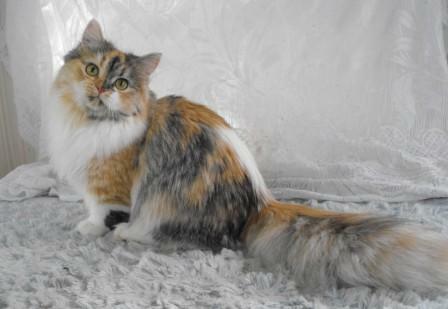 The short coat is plush, dense and soft, whilst the longhaired cat has a soft, straight coat with a thick undercoat. Napoleons are suited to indoor living. Whilst their legs do not restrict their mobility, they certainly do not have the speed of a cat with 'normal-length' legs which will make it difficult for them to get out of harms way. Longhaired cats tend to get their fur matted with sticks and leaves making grooming difficult. Naps, as they are fondly called, do not enjoy solitude. They do enjoy the company of other cats and cat-socialized dogs. 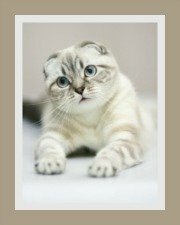 They are playful and reasonably active cats who enjoy running around. Because of their shortened legs, they are not great jumpers, but they do find inventive ways of climbing up on furniture and beds to cuddle up. The shorhaired variety will need to be brushed weekly, whilst the longhaired cat needs daily brushing. For complete grooming tips, visit the chapter on cat hair care. It appears that the Napoleon cat is a healthy breed. Lordosis (an inward curvature of the spine) and pectus excavatum (a deformity of the chest causing a sunken or funnel chest). Naturally all cats need to be vaccinated against infectious feline diseases. Always buy the best cat food you can afford. You have a choice of raw, canned and dry cat food. Speak to the breeder about the most appropriate diet. You do need to provide your kitty with fresh water daily - not milk. Milk should be given as an occasional treat only - many cats are lactose intolerant! Life span is determined by a number of factors like general health, exercise, and diet. 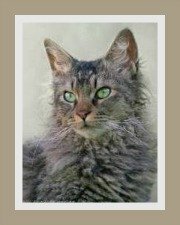 A healthy well cared for cat could live for 9 to 15 years.